The news of Michael Jackson's passing is shocking, but perhaps not surprising. Many of Jackson's troubles--and there were a lot--were self-created. He was said to be capricous in his relationships, prone to erratic, druggy behavior, and, worst of all, apparently abusive to children. If half of what his detractors say about him is true, then he was often a terrible person. But extenuating circumstances exist which help explain, if not forgive, his dysfunctionality. How could his life have ever been normal, what with an abusive father, a childhood spent performing rather than playing, and the misfortune to grow up in the public eye? The books will be written about his life, his death, and his troubles. I don't plan on reading them. But what I will do is remember the music he and his family made that transcends the worst of human behavior. "I Am Love" is not a commonly known Jackson 5 track these days. The reference books state that it was a #15 single in early 1975. From their second-to-last album on Motown, Dancing Machine, its seven-minute length make it difficult to program on oldies radio (even though an AM-friendly mix was made at the time). But I remember this song so well...in those long-ago days, when I was approaching 12 years of age, and trying to figure out what this world, and its people, and relationships, and music, were all about, this song sounded like the Godhead itself. Beginning slowly, almost mournfully, with Jermaine Jackson's pleading vocal, "I Am Love" is rooted by a lovely, gauzy electric piano. The spare instrumentation establishes a lovely, lush, and almost trippy feel, while the short chorus phrase gets all odd and psychedelic. Soon, the tempo builds, first to a crawl, with funky bass and clavinet underpinning the arrangement. Michael takes the mic and sings powerfully, doing a masterful job singing good, but difficult to scan, lyrics. Then the band kicks into double-time! Congas join the party, and fuzzy guitar and synthesizers take solos before all five Jacksons come back to the arrangement, trading phrases and never sounding more together than on this desperate, but uplifting and driving, hymn to the power of love. It's their great psychedelic funk masterwork, one that never fails to inspire me with its passion. And that's how I choose to remember Michael Jackson. Here's my song of the moment. 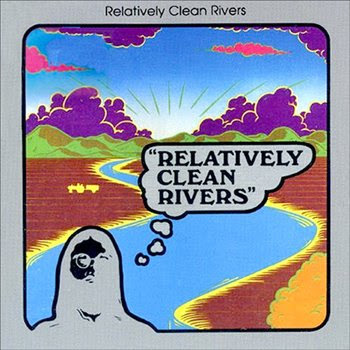 "Easy Ride" is by a 1970s California band called Relatively Clean Rivers, headed by a fellow named Phil Pearlman, known to 1960s psychedelic obsessives for a project called Beat of the Earth. While this song, the first on the band's only LP, has been compared to the Grateful Dead for its loping tempo, the constrained and close-ended feel make it a bit too dark for the Dead (who, frankly, I don't really dig). The occasionally Dylanesque delivery doesn't really fit the lyrics; the guitars are crystalline and the harmonies have enough blue notes to feel a bit unsettling. Like most songs on these self-pressed records, it seems more than slightly out of time, existing in its own world. It certainly doesn't sound as if it were released in 1975. Great album cover, too, huh? I love this song. Hope you dig it too. More on Relatively Clean Rivers.